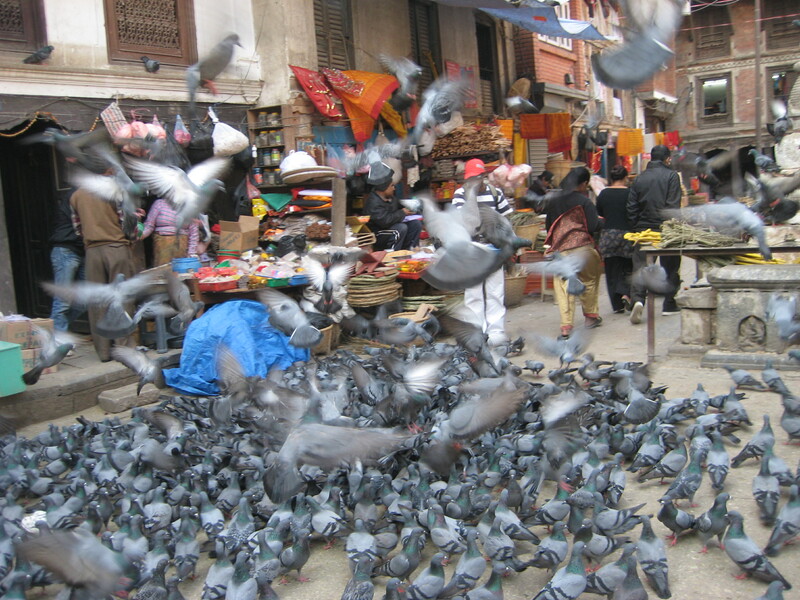 I was in a rush, winding through the narrow chintzy streets of Thamel. The tourist section of Kathmandu has the same charm as Hershey’s chocolate milk: artificial and homogenized in a way that should be revolting, but is attractively digestible instead. I tend to keep my head down in Thamel’s chaotic alleyways. There isn’t a lot of room to maneuver, and rather than dodge oncoming hippies and tiger balm vendors and tuk-tuks and the occasional ill-advised taxi driver, I find it more efficient to simply watch my feet and make sure they don’t step on anything within a 1-foot radius. Usually that gets me where I’m going with the fewest number of unnecessary traffic encounters. Not that afternoon. A street boy had breached the 1-foot no-entry zone and was looking up at me. I barely noticed the stack of rumpled schoolbook pages in his hand before I brushed by him. “No thanks, little brother,” I said. So many street children. The agencies say that handouts only exacerbate the problem. There are so many agencies. There are so many tiger balm vendors and hippies and there is so little room to maneuver. I kept my head down and pushed along the clamoring street. I slowed, and then stopped. Was that boy selling drawings? I turned around and saw him in the road. I’d spent a year pulling my hair out in Kaskikot, trying to get elementary school kids to combine imagination and paper the way they combined imagination and trees and rocks and flat soccer balls. To inspire enterprising attitudes through art, and make notebooks spaces for creation, so that school would be about possibilities. Flustered, he turned over the ripped lined pages and I mulled over them carefully. They were all colored-pencil drawings and had been carried around a fair amount, but with what flatness they still had, retained a look of attempted composure that was very charming. “What is this picture?” I asked importantly. Wide-eyed, the boy scrambled for an answer. On a good day, he was probably lucky to sell a picture or two for five or ten rupees each. “YES MISS!!!! !” the boy cried, and then disappeared in to the swirl and clutter. 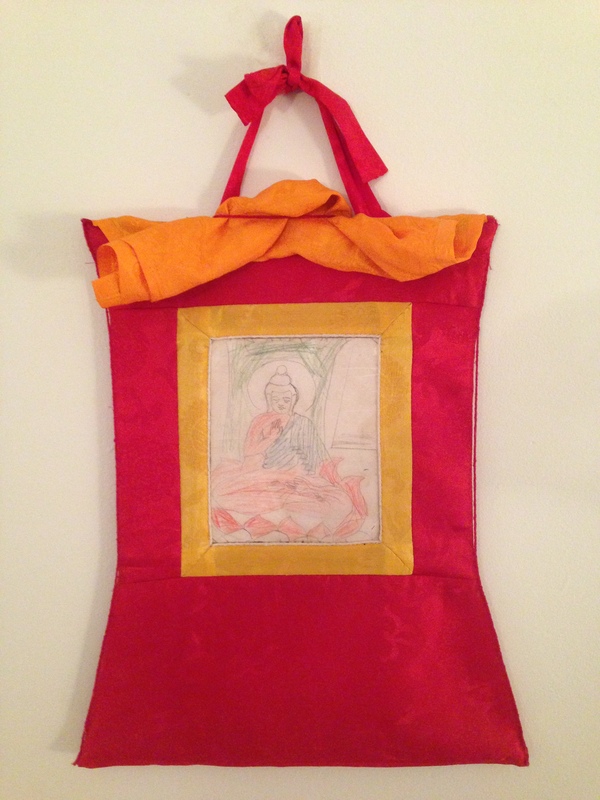 A few weeks later, I had the Buddha framed in cloth like a traditional thanka. It is definitely the most magical thanka I will ever own, and ten years later, it still hangs in my home office in Connecticut, across from my desk, reminding me to stop and look up in the crowded and relentless street. The tuk-tuks can dodge us for a darn second.